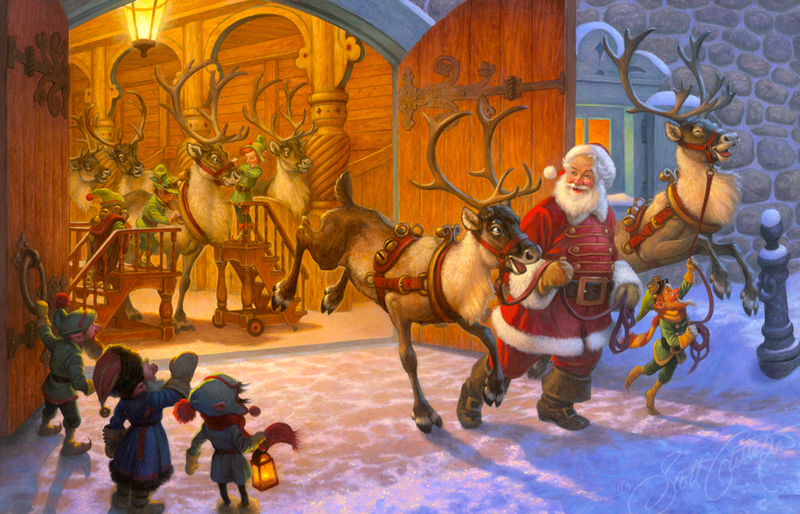 “Christmas Eve and Raring to Go!” - oil on panel, 38” x 24,” original sold as a personal commission to a private collector - now available as a giclee print! See details below! gallery wrapped with black printed edges on sides, for easy framing OR immediate hanging on your wall this Christmas season! Please fill out the order form below and we”ll be back in touch with a shipping quote. Please note: Giclee prints are not mass-produced, and are shipped via FedEx in flat boxes, so we'll contact you with the billing and shipping details based on your location. Please allow a few weeks for processing. *Prints ship in flat boxes via FedEx Home delivery to most US locations. We will contact you with specific shipping quote. Please let us know if you have any questions or special thoughts regarding this order, or if you'd like to order a different quantity of prints. Thank you, and we will be contacting you soon! Thanks so much for your interest in this giclee canvas print!